Welcome to the “Golf Capital”! Imagine stepping out of your front door in Green Valley, Arizona and being able to play golf year -round. Known as the “golf capital”, Green Valley, Arizona has 7 golf courses just minutes from anywhere in Green Valley and 2 others that are a short distance away. Best of all 6 of the 9 are open to the public and all offer incredible deals on green fees during the off season. Canoa Ranch Golf Club was named as one of Golf Digest’s “New Favorites” in Arizona in March of 2006. This course is a great example of how the Southwestern desert can be transformed into a golfer’s paradise without destroying the beauty of the surrounding native land. Canoa Ranch boasts dramatic elevation changes, strategic bunkering and spectacular views of Elephant Head. From the panoramic views of Elephant Head to the beauty of the Sonoran desert, a round of golf at the Green Valley, Canoa Ranch is an enjoyable, and memorable experience. Be sure to take the time to dine at Grill on the Green, for a tasty dining experience. The Country Club of Green Valley is a private full-service member-owned club that offers a number of different membership options. All memberships are subject to monthly dues and captial assessments when necessary and have reciprocal privileges with hundreds of other privates clubs across the Country. This well-maintained all seasons golf course is deceptively challenging so plan on using every club in your bag! Each manicured green is protected by well-placed bunkers. Water hazards come into play on six out of the 18 Holes and there are five sets of tees ranging from 4,809 Yards to 6,628 Yards. The Country Club Of Green Valley also offers one of the finest practice facilities in Southern Arizona. There are chipping, putting, driving and bunker areas provided to tune up your game. Best of all unlimited free practice balls are included with membership. menus to meet your needs of a special event, anniversary party, etc. He prepares every meal to the highest standard possible. Come and enjoy his wonderful food for an experience you will never forget. The Desert Hills Golf Club is an equity based, privately owned and operated club by an elected Board of Directors. Members are convinced that Desert Hills Golf Club is the best-designed and maintained golf course in the area with a layout that is well suited to golfers at all skill levels. Membership is limited to allow ample playing time for all member golfers. . The golf course and club house are maintained and operated for the benefit of the members and their guests. The course consists of 120 acres, including 3 lakes covering 6 acres. Fairways and rough are Bermuda #419 Tifway Hybrid. Greens are now Tifdwarf Bermuda, and are considered the best in the area. 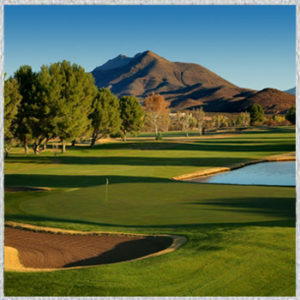 The golf course at Esplendor in Rio Rico Resort and Country is a Robert Trent Jones Sr. designed par-72 championship course that is rated as one of the Top 25 Pulic Courses in the State of Arizona. This golf course is a classic with gently rolling fairways and large greens providing a beautiful yet challenging experience for even the most accomplished golfer. Fairways are lined with huge pine and mesquite trees requiring golfers to shape their shots. The fairways are tee to green and as such high handicapper friendly, yet challenging enough to entice the more serious player and longer hitter. Located approximately 40 minutes south of Green Valley Arizona, Rio Rico–just a short 10 minute drive from the Arizona/Mexico border should you decide to take in the rich cultural heritage offered by our neighbors to the South. The Resort’s popular “Play A Round” package includes 18 holes of golf, room accommodations – call for specific package pricing. If you like the chance to get out and walk while playing a round of golf, then Haven Golf Course is the one for you…it is Green Valley’s only “walking allowed” golf course. 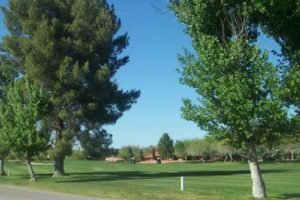 Established in 1967 and located just east of I-19 in the heart of Green Valley, the Haven Golf Course is ideal for players of all skill levels. The golf course runs along the western banks of the Santa Cruz River, is traditional in design with Bermuda grass throughout. You’ll love the mature landscaping that features large pine, eucallytus and palm trees with initing water on many of the holes. Open dawn to dusk, the course is the oldest in Green Valley and has beautiful wide fairways. The “19th” Hole features a wrap around enclosed porch offering golfers unobstructed views of the Santa Rita Mountains. Also part of the Haven Golf Course is the Tortuga Golf Course, a par 3 – 9 holes of play. It’s flat and well marked for yardage (100, 150 and 200 yards out). It plays 6,849 yards from the back tees, 6,336 yards from the regular tees and 5,811 yards from the forward tees. While membership to the Quail Creek Golf Course is limited to homeowners, non-residents can play on 27 holes of championship golf on designated days. Winding through the high Sonoran desert terrain with the Santa Rita Mountains providing a panoramic backdrop, Quail Creek’s championship golf is framed by an inspiring southwestern setting, and makes every round memorable for all levels of players, even beginners! Located directly behind the Quail Creek/Coyote 9th hole is the Pro Shop and Grill. The fully stocked pro shop has all the latest golf fashions and league information. The Quail Creek Grill features a casual and friendly atmosphere, great food & drinks to be shared with friends after a round of golf. The San Ignacio Golf Club, sits nestled between the Santa Rita and Tumacacori mountain ranges at 3,000 feet elevation, providing for a spectacular and challenging desert-golf destination. The course’s beauty is further enhanced by Santa Catalina and Rincon mountains, which rise in the distance, giving players even more breathtaking views as they wind their way around the tranquil tract of holes. When Arthur Hills sculpted the course into the area’s natural canyons, he was able to utilize the existing topography and create dramatic elevation changes throughout the layout. Each fairway is defined by the natural landscape and abundance of mesquite trees giving each hole a feeling of privacy. As the fairways make their way up to multi-tiered greens, your view will open up to some of the best putting surfaces in southern Arizona. Strategic pin placement on the multi-tiered greens gives players a different experience every time they tee it up at San Ignacio. Part of the Wildcat Trail golf network. 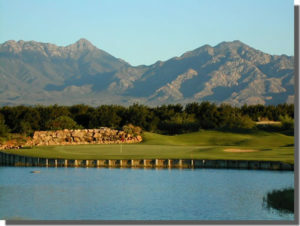 Torres Blancas Golf Club , is nestled in the Santa Cruz River Valley at the foot of the beautiful Santa Rita Mountains. This golfing adventure offers a championship course designed by Lee Trevino, Ocampo and Fernandez. Torres Blancas meanders through charming neighborhoods and breathtaking desert scenery. The par 72 course comes with 3 lakes, numerous sand traps and generous, undulating greens. Four sets of tees offer a challenge to golfers of all abilities with a maximum yardage of 6997 from the tournament tees and 5200 yards from the forward tees.This links style golf course offers championship play for the enthusiastic golfer of all abilities. Adjoining restaurant is part of the Metro Restaurant Group offers a full wine list and bar. Tubac Golf Resort & Spa is Located approximately 20 minutes south of Green Valley Arizona, in one of the oldest European settlements in Arizona–Tubac. Tubac Golf Resort & Spa’s 27 hole championship course makes it the perfect Arizona golf resort. Designed in 1959 by renowned golf course architect Robert “Red” Lawrence, the original 18 hole course stood as the most desirable in the Southwest, and was where many of the scenes of Kevin Costner’s 1996 golf movie Tin Cup was filmed. In the fall of 2006 local golf course architect Ken Kavanaugh added nine new holes, significantly enhancing the preexisting cottonwood treed and lushly verdant layout. Featuring the most challenging fairways set against the breakthtakingly beautiful Arizona skyline, this championship course allows golfers to hone their skills at the professional level. You’ll want to make a day and night out of this scenic golfing excursion as there is plenty to do in the thriving Tubac village and so many restaurants to choose from, not to mention a full service spa for taking the kinks out after a round of golf.